Our friends TK & JK came over a few weekends ago and we feasted on a meal grilled in its entirety, minus the baked beans. (You may remember TK & JK from my post about Dune Dog Cafe). They served as my guinea pigs as I tested out a new recipe I found in Allrecipes Magazine: Grilled Spiced Corn with Bacon. Let me tell you, it is every bit as delicious as it sounds. When can you ever go wrong with bacon? Fresh ears of Florida corn. Choose from yellow, white, or bi-colored corn. I try to use as many organic ingredients as possible when I cook. Here, I used organic olive oil but not organic spices. (I omitted 2 teaspoons of ground coriander from the recipe simply because I didn’t have any. Feel free to add your own spices to the mix). I have not been impressed with my food photography skills lately so if anyone has suggestions, please share in the comments section at the end of the post. Preheat the grill to 375-450 degrees. Mix together the chili powder, cumin, oregano, and oil. I adore my Anchor Hocking measuring cups, which I own in three different sizes. They always come in handy when baking and cooking. Rub the oil and spice mixture over the corn. I used the back of a spoon but I think that a brush would be much more effective in getting the job done. 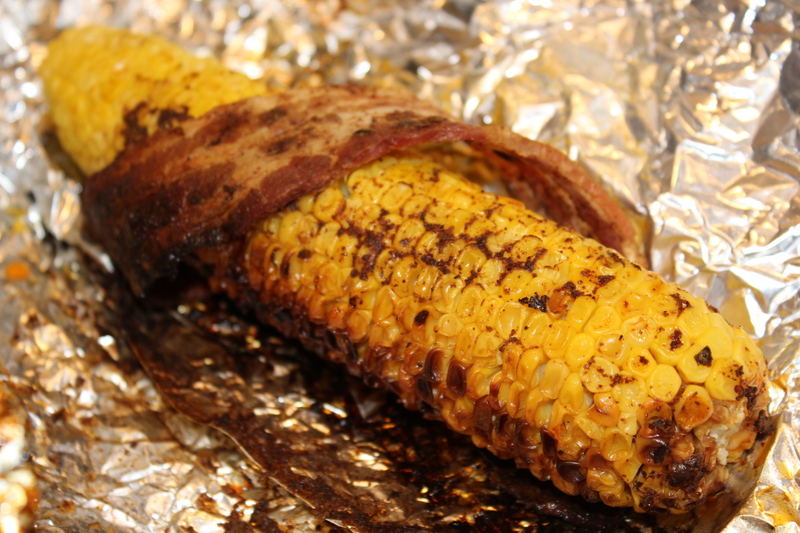 Here comes the best part… wrap each ear of corn in a bacon slice. I use Applegate Natural Sunday Bacon, which is made without added nitrates or chemical preservatives. Wrap the “baconized” ears of corn in double layers of regular foil. Grill the corn until the bacon is cooked. For us, that was about 30 minutes. The bacon will not be crisp. Grill Master P, making us some delicious corn on the cob! Be careful once you remove the corn from the grill and unwrap the foil. The corn is hot and steamy! Enjoy your spicy, bacony, ears of corn – no butter needed! How do you like to cook your corn? Grilled and blackened? Boiled on the stove? Post your preference in the comment section below.